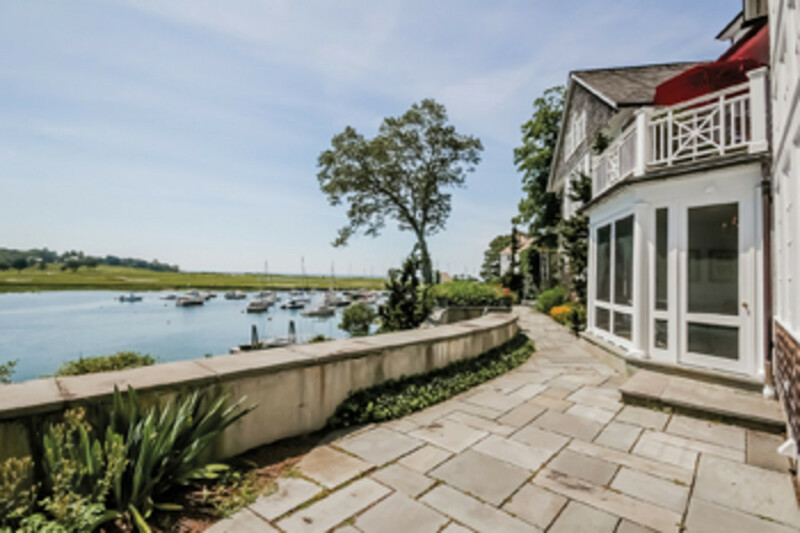 “We built here to capitalize on the view,” Ed Lahey says of the Southport section of Fairfield, Connecticut, gesturing to the dramatic panorama across Southport Harbor and Long Island Sound. Built on the side of a hill, the house has expansive harbor views in every room. 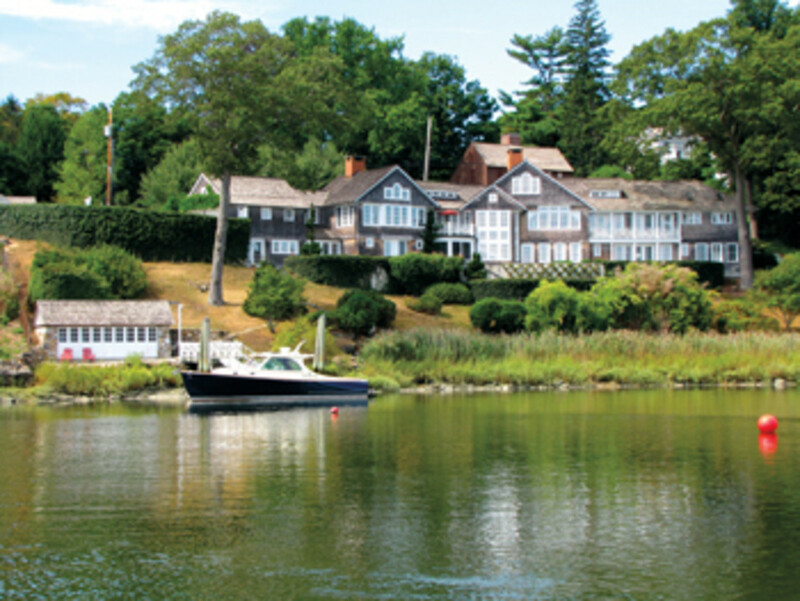 After living there for almost two decades, enjoying the “great sailing and cruising base at the start of New England,” Lahey and his wife, Joan, plan to downsize and move to Florida. 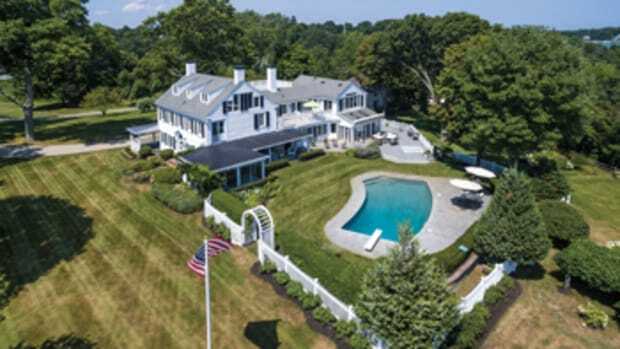 Their 0.76-acre property, which has a three-story, four-bedroom, 5-1/2-bath Nantucket-style home of 6,157 square feet, an attached two-car garage, a boathouse and a deep-water dock, is on the market for $7.25 million. 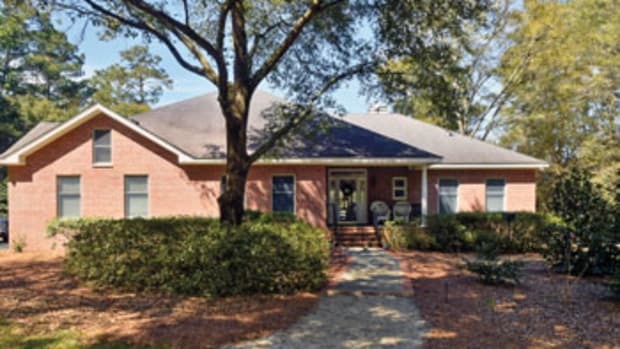 “Our house is terrifically livable, with a modern flow, well-designed kitchen and completely separate master suite,” says Lahey, a 76-year-old retired corporate lawyer. Soaring ceilings, waterfront window walls, custom millwork, built-in cabinetry and hardwood floors create a casually elegant interior. 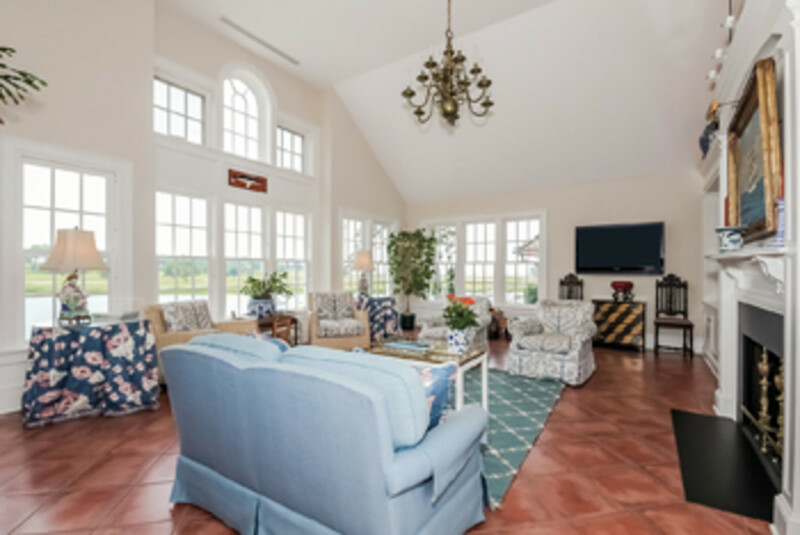 Guests enter the house through the foyer on the main level, and there are immediate harbor views through the central dining room’s waterfront window walls. 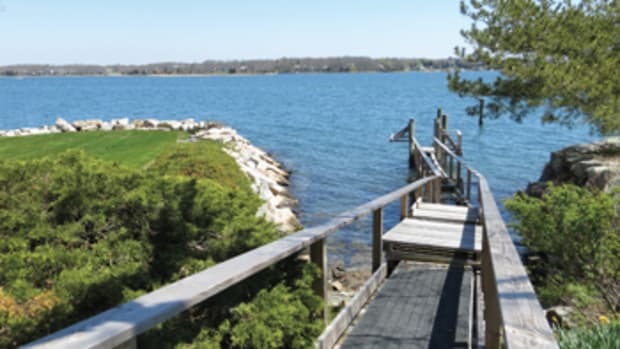 “I can sit here at the table and look through the kitchen and family room, across the harbor to the [Country Club of Fairfield’s] golf course, Long Island Sound and Long Island itself. A fabulous view,” he says. The adjacent living room (which has a gas log fireplace) buffers the master suite, which occupies one end of the house. 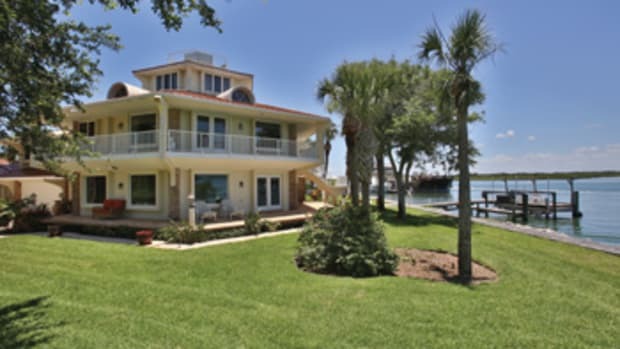 The master sitting room and bedroom open to a private columned waterfront porch 40 feet above the harbor. His-and-her full baths and walk-in closets complete the suite. Japanese gardens with a koi pond and waterfall grace the inland view. The kitchen stands on the other side of the dining room. A granite-topped storage island separates the waterfront breakfast area from the work area’s custom cabinets, twin sinks, double wall ovens, refrigerator, gas cooktop and walk-in pantry. 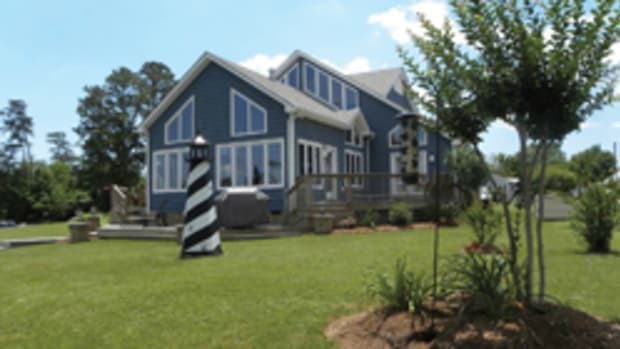 The Laheys frequently dine on the secluded stone-floored harbor-front deck off the kitchen. “We spend most of our time in the great room near the kitchen,” Lahey says. The cathedral-ceilinged room features custom built-ins, a gas log fireplace and dramatic views through two window walls. A custom floating staircase connects the dining room with the two-bedroom apartment below. 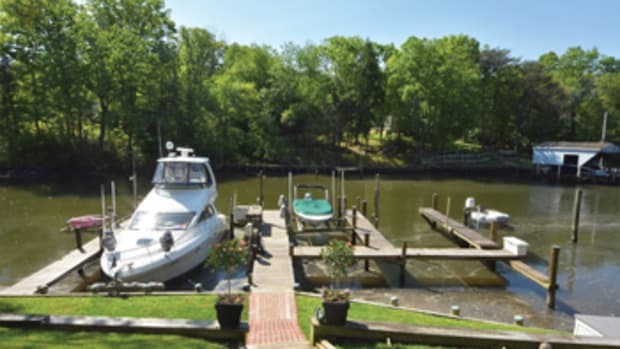 Its kitchenette and wet bar simplify entertaining on the screened porch off the sunroom, a favorite boat-watching spot. A third lower-level bedroom, a full bath, an exercise room and a wine cellar are reached from the terrace and the mudroom by the garage. 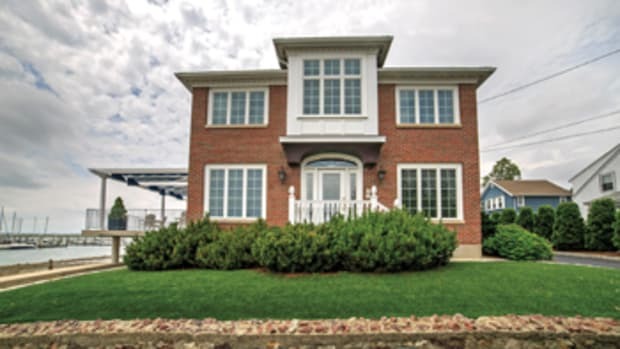 Multilevel bluestone terraces wrap around the house, creating intimate seating areas overlooking the gardens or harbor. The heated paver driveway eliminates winter shoveling. Stone paths wind through the “naturally wild” landscaped grounds to the stone boathouse and floating dock. The boathouse converts to a covered entertainment area when the waterfront doors are removed. The dock, at the upper end of the dredged harbor channel, has 7-foot depths at mean low water. Long Island Sound is about five minutes away. “Above us, you can explore only by small boat,” says Lahey, who has owned many sailboats and powerboats, most recently a 1944 Down East lobster boat. Major shopping, dining and services are in Fairfield (two miles) and Westport (six miles). Annual taxes are about $78,700. 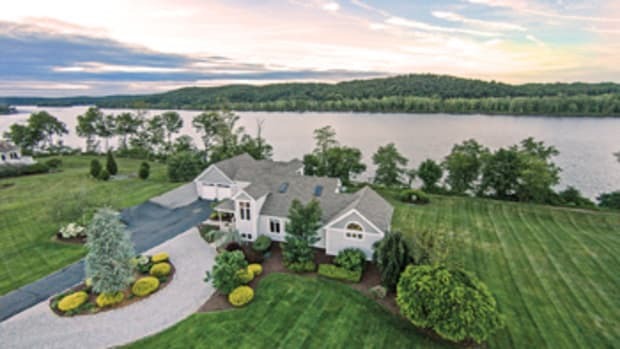 Matt Lahey, (203) 767-4190, of William Raveis Real Estate, Fairfield/Southport, Connecticut, and Ted Lahey, (203) 455-4431, of The Hinckley Co. in the Rowayton section of Norwalk, Connecticut, list the property. This article originally appeared in the September 2015 issue.